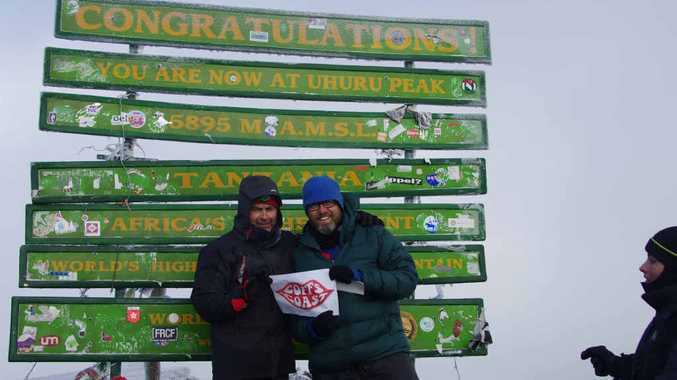 MISSION ACCOMPLISHED: Stve Forkin and Russ Holland on the summit of Mt Kilimanjaro. LOCAL identities Russ Holland and Steve Forkin still have their heads in the clouds after conquering one of the world's most majestic peaks. The pair has returned from Tanzania, having reached the summit of Mt Kilimanjaro and enriched the lives of children facing insurmountable challenges. "It was an amazing experience which has given me a different perspective on life," Russ said. "Climbing the mountain and meeting the people of Tanzania reminded me of how simple life can be and how lucky we are here in Australia." "It is said that you find something of yourself when you climb Kili. For me it was about realising how much you can push yourself physically, mentally and emotionally. For Steve Forkin the adventure has rekindled a childhood dream to climb many mountains. "It was initially an opportunity to get fit and do something for charity but ascending the mountain was such an intense experience I just want to do more climbing," Steve said. The contingent of 16 Australians and one American used the six day climb to raise $83,000 for the Make a Wish Foundation. "As the father of three healthy boys it was humbling to meet some of the Make A Wish families ... You get an understanding that we are all sometimes stuck on material achievement and possessions," Steve said. For Russ a note his daughter summed up the adventure. "The note said 'You don't climb a mountain so the world can see you. You climb a mountain so you can see the world'. It is so true."